It's tough being a farmer (don't Aussie farmers know it!?). You have to wake early. There's stacks of manual labour. Your animals need you. And they need lots to eat. Told in the third person, this is such a simple yet divinely clever twist on the typical farm book for wee ones--even those kids not particularly interested in dinosaurs will love the quandaries our farmer finds himself in while trying to operate a prehistoric farm. When the pond gets dirty, you must clean it out. Tougher when a brontesaurus is in residence. And your animals will make a lot of poopy mess that has to be sorted out (extra-large mounds, of course). Then there's the prehistoric, man-eating plants that need watered every day. 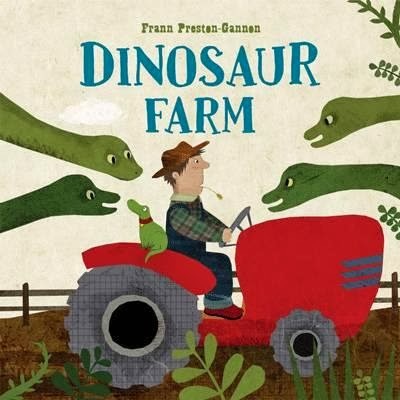 Yes, the life of a farmer is tough and kids will delight in the humour and charm of this book and its adorable illustrations of a farmer virtually pummeled with love and affection by day's end. There will be many a repeat read--at bedtime, at afternoon play time, at meal time. I particularly love the great hulking steak our farmer totes out for the T-Rex. Great fun and a really gorgeous ending (hurrah! ).